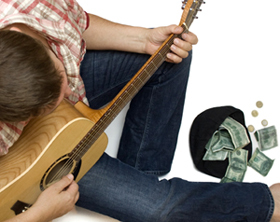 If you are booking paying gigs at all, you at least have a toe in the business side of music. That is, you are performing music in exchange for money. Now, depending on your goals, you may not be making as much money as you hoped. To move forward, there are a few things you need do to get where you want to go. Do you know where you want to end up? If the answer is in a penthouse, rolling in piles of money, while your agent turns down gigs because your worldwide tour is sold out, you may need to take a hard look at what you’re doing to achieve that dream. Most of the successful bands and artists you’ve heard of today had a long, hard road to success. They worked grueling hours. They played every thankless gig they could get their hands on. They subjected themselves to rejection in an effort to get their name out to agents, labels, and fans. Most success stories are less a random discovery of untapped musical talent and are more stories of struggle, frustration, and just plain stubborn determination. However, each successful artist would probably tell you that the thing that kept him or her going was an unceasing desire to reach a particular milestone. So, determine where you want to go. This will help you create a roadmap to reach your desired destination. Whether you are a solo artist or a band, chances are you don’t have your music career all figured out, or you wouldn’t be reading this article. Just a guess. No problem. There’s help out there for you, once you identify the areas where you need it. 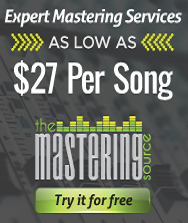 In step two, did you find that your songwriting needs help? Perfect! There are entire communities of songwriters just waiting for someone to use their songs. These people are often times willing to collaborate with others (you) to create something more tailored to your sound. Can’t find anybody in your town? Through the wonder of the Internet proximity is no longer an issue. If you feel you have untapped potential in the area that is currently (i.e. your songwriting is not quite where you want it) keep honing your skill. The really good songwriters got good by failing a lot first. Are there bands in your area whose sound you like? Or maybe you appreciate their approach to stage presence. Or maybe you just wonder how to get gigs like the one they’re playing. It might not be a bad idea to find a mentor in the accessible local bands you like. Email them and invite them to have coffee or a drink. Find out if you can pick their brain. If you hit it off plan a jam session. Write together. Maybe you’ll develop a networking relationship with them and who knows where that could lead. More connections? At the end of the day you need people who have gone before you – people with more experience. Seek them out. One day you may be the one giving highly coveted advice to a newbie band. You’re versatile. You’re a mystery. You can’t be pinned down, because you’re universal. Genre-less. Great. Here’s the potential issue. People like categories. Sorry. So, it’s ok if you’re creating a newish sound like Soul/Pop. But, if you’re so ethereal or all-over-the-map that only major hallucinogens enable to connect with your music, you may want to reconsider your approach. Establish the strength of your style’s sound and stick to it. When you have established a solid fan base and have met some of your milestones of success, you can experiment a little. When you’re nationally recognized, multimillionaire you can redefine yourself and take a completely new direction, if you dare. You may have already guessed or even experienced that this is a necessary step. This is the step that can waylay or even remove many talented people from the pursuit of their musical goals. It’s hard out there for a band. The problem is there’s this idea out there that if you want it enough you’ll achieve success. The problem countless people want to achieve their musical dreams and, unfortunately, it won’t happen for everyone. It also takes a measure of humility, especially if you are a legend in your own mind, to play kids birthday or smoky bars or tour (and live) in a cramped van. You have to account for small beginnings – even if you’ve won some battle of the bands or had a cancelled record deal. Whether it’s practicing or networking or gigging (and it’s all of those things) there will be many hours of work. The bottom line is this: do you want it enough to work for it? Having said all that I’ve said about step five, keep this in mind… hard work can be coupled with efficiency. Here’s what I mean. You, the band or artist, have a responsibility to yourself and anyone who wants to keep hearing your music to define what success looks like for you. If music is your main source of income then eating, paying rent, and affording your lifestyle is the very basic measure of success. If you’re a grown person mooching off the people you know because music isn’t paying the bills, you need a new strategy. Are you spending more on gear then your gigs are paying? Did you order a thousand t-shirts when your fan mailing list consists of 87 people? Hoping for success and working toward success are two different things. If music isn’t paying the bills you need to sit down and figure out why. If you have inroads in the local music scene, you probably have a good idea how much money each venue will pay. Instead of working on your band’s awesome logo, you need to play as much as possible. At those gigs, get people to sign-up for your newsletter. This will allow you to track who has an interest in your music. Communicate with these folks. Tell them when and where you’re playing and give them a reason to bring their friends (free bumper stickers or EPs or make a deal with the venue that your fans get ½ off their first drinks). Have your mailing list sign up at every gig and connect with the people in the audience, both on and off stage. To fund an album, do a PledgeMusic campaign and raise most of your capital before heading into the studio. If you do have an album, be aware that iTunes takes a good percentage of the song sale without allowing you a way to track who bought it. 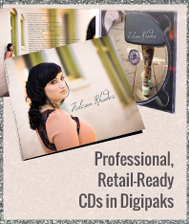 Consider instead having your own online storefront and selling your albums there. Or sell through Amazon. Sure, be on iTunes, but don’t allow that to be your only outlet. And, do everything you can to drive traffic to your storefront. It’s ok to be smart about your approach and think these things out before charging headlong into the musical abyss. Have a plan. You are a musician, but until you hire these people out you are also your own marketer, agent, salesperson, etc. If you don’t know how to fulfill those roles, see step three. Now get out there and make some music! Just mentioning that name calls up several wildly different things to mind. A rap superstar, that one guy who was mean to Taylor Swift, a man who loves Twitter rants, and most recently, a future presidential candidate. And while Kanye is a polarizing figure, he is without a doubt one of the most successful artists of the past few years. Not only is he successful in music, he’s also recently had some success in the fashion world. New York Fashion Week just ended, and during the week the magazine Vanity Fair interviewed Kanye. I read this article on a whim. It looked semi-interesting, and I was semi-bored. After the first few paragraphs, I was sitting up in my chair. This wasn’t the Kanye I had seen on late night television. This was an interview with a successful, albeit eccentric, businessman who knew what he was doing. The article is a longer read, but I recommend you check it out. At Source, we believe that where there is success, there is something we can learn from it. As an independent musician, I want to learn everything I can to help create my own successful career. 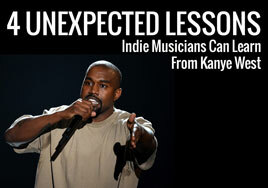 So I pay attention when those lessons come, even from unexpected places—like Kanye West. Taken out of the context of the article, this quote may seem a little odd. Kanye was talking about the brick and mortar store he wants to open for his fashion line. The interviewer wanted to know if there were any concrete plans for this store, and Kanye responded,“The only concrete plan is that I plan to use concrete.” There are no dates here, no timelines, and no deadlines. There’s no actual location yet, but he knows what he wants. He has a vision for what the future of his clothing line can be. But even though he has a vision, he’s not micro-managing his creativity. He has a vision, and probably some rough plans, but they are flexible. He knows that what is in his head right now might not be quite the right fit when it comes time to actually build the store. But he has a core concept, and he’s going to stay true to that concept, though the details may change. The same goes with your big ideas. You may have an idea for an album or tour that isn’t ready to get fleshed out right now. And that’s awesome. You should always be cultivating those creative parts of you. Keep your overarching vision in mind, but don’t sweat the small stuff. Sometimes creative people create and then don’t move forward. Putting a few lyric lines down on a page or recording a new melody that pops in your head is the easy stuff. Sitting down, really thinking about and finishing a song, and seeing that song through to it’s final mastered state is a very different thing than just having a moment of creative inspiration. Indie artists have to realize it’s the same thing with their music. It’s the same thing with those good intentions toward marketing. Having an idea and talking about the idea are very different things from the idea becoming a reality. Successful people move out of the ethereal and into implementation. Here Kanye was speaking specifically about creating something that people love and will use, but I think these words can move us further than that–what do we really need? Take a look at what you can practically do for your music career. If you are buying new gear, what is going to serve you best, not just make you feel fancy? If you really want to tour, what cities can you hit on a weekend tour or over a couple of weeks? You need fans–are you really going to join every brand new social network, or are you going to pinpoint where your fans are and meet them there? Music careers always start with big dreams, but those dreams get easily lost if you aren’t practical about them. You create music because you love music, right? Would you love music as much if no one cared about how they created music? If everyone sang off key and out of tempo, using the same rhyme scheme for every line, music would not have the power that it does. 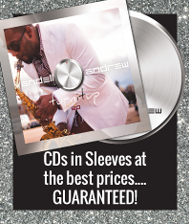 That intangible power of music is a driving force behind your CD sales, whether you acknowledge it or not. So make something great! Make something that connects deeply with people because it connects deeply with you. You are an artist, so create beautiful, meaninglful art! Have you ever gone to the grocery store and bought a whole trunk full of food, and realized when you got home that you have nothing to actually eat? You bought good food, but you can’t make a complete meal out of any of it. Being an independent musician can feel like that sometimes. There are lots of choices, lots of decisions to be made, but in the end, what makes up a successful career? Some people want Ramen noodles for dinner. Some people want steak and potatoes. Others may want lasagna. People have different tastes, and musicians are going to have different ideas about what being a truly “successful” artist looks like. You have to decide what defines success for you. I know, this is a terrible question. You hate pigeonholing yourself. I understand. But practically, you need to have some idea of the genre of music you play, and the sub-genre you fit into. Some genre decisions are easy. You may know without a doubt that you are a country artist. But where exactly do you fit in country? Are you Texas country? Nashville pop? Bro-country? If you’re a rock artist, are you punk? Neo-grunge? You play folk? Does it lean more bluegrass or folk/rock? There are hundreds of choices. You don’t have to stuff yourself into a tiny box. But having a good, descriptive genre can help you communicate with listeners, distributors, labels, venues….the list goes on and on. When you know yourself well, you can help other people get to know you. And you can make wise decisions about where you are headed. Who is Successful in my genre? There’s a good chance you’re already listening to artists whose music is similar to yours. Do some research on someone who you would consider successful in your genre. This might be someone like Carrie Underwood, Sufjan Stevens, Kendrick Lamar, Joywave, or Sara Bareilles. Knowing who is doing well in your genre can give you a good starting place as you try to determine your idea of success. It will also help you be realistic about your aspirations. If there is a large audience for your genre of music, your definition of success might be broader than someone who has a more niche market. Country, pop and hip-hop artists at the top of their game regularly play arenas. A artist who makes meditation music probably won’t be playing in an arena, but that doesn’t mean they aren’t successful. Having your dreams of a music career firmly planted in the solid ground of what’s actually possible will help you avoid major disappointments, and will give your career a foundation to stand on. So you know who you are, you know what is possible, now what do you want? This is going to look different for every person. We all have different dreams, goals, locations, resources, skills, and talents. Maybe your idea of success is as grand as playing sold out stadiums. Maybe it’s creating music full time and sharing your music regionally. Maybe it’s playing once a week at an open mic or being signed to a record label. All of these ideas of success are good goals to work towards. Take a second to jot down what success looks like for you. It doesn’t have to be a long description, maybe it’s just a few key words. But go ahead, put it in writing. Then put it somewhere you’re going to look at it. You might tape it to your mirror, or put it on the dashboard of your car. Remind yourself daily of what you want your career to look like. Success in the music industry (or any industry) takes hard work, dedication, and action. When you know the direction you want to go in, you can begin to take the steps to get there. No success is overnight. If you look at the careers of many top level artists, you will see years of hard work behind current successes. If success is achieved too easily, it will disappear just as fast as it’s gained. You have to put in blood, sweat, and tears to reach career goals. But what if your goal is miles ahead of where you are now? It might seem like an impossible task to get to where you want to be. To get to any level of success, it’s a good idea to have smaller goals leading up to the big one. This allows you to track your progress, and can keep you from getting discouraged. Want to play in huge arenas? Start with shows in a coffee shop, or play some open mic nights. Once you feel comfortable there, and people are responding well, start trying to get shows at venues with a bigger capacity. Do you want to be a hit producer? Start analyzing songs and find out what makes them great, and ask a friend if you can arrange a song or two for them. Small steps and manageable goals add up to create success. You also need to be able to look objectively at your idea of success and your goals. You need to know when they aren’t going to work. This is extremely difficult, but knowing when to back out of something that’s not working is just as important as moving forward when something goes well. Sometimes, life just doesn’t work the way you want it to. You need to be able to step back—even when that’s the last thing we want to do—and objectively look at what’s going on. You may need to reevaluate your overarching career goals. You might just need to alter the way you are trying to achieve those goals. I’m not saying you should give up. What I am saying is that we live in the real world, not fantasy music land. Things aren’t always going to go exactly the way you want them to. Sometimes we are limited by circumstances beyond our control. That doesn’t mean you throw in the towel, it just means that you look for an alternate route. Detours are hardly ever pleasant, but a road is a road, and can still take you to your destination. Being a successful musician is going to look different for everyone. Knowing your own personal idea of success is the first step in achieving your music industry goals. Don’t hate me, but it seems that the life of a serious vocalist—whatever your genre—is less the Hollywood portrayal of all-night partying (and all that comes with such a scene) and more of self-control and pampering. I mean, the things it takes to really care for the vocal instrument seem, ahem, a little nerdy—or boring, if you like. But, please don’t let a little boring deter you, because this is serious stuff. It’s not like you can pack your vocal chords up in a nice little case and put them away for safekeeping, like most instruments. So, what are some practical ways in which you can care for your voice box (also known as your larynx, which houses your vocal chords or vocal folds)? This step is something that you can do pretty much anytime, anywhere: drink lots of water. The reason for this? The more water you drink, the thinner the mucous on your vocal chords will be, which means less vocal interruption for you. Make sure you are well hydrated by drinking the recommended 64 ounces per day. If you have an affinity for dehydrating liquids (such as alcohol or caffeinated beverages), you’ll need to up your water intake even more; a good rule of thumb is to drink at least as many ounces of water as you are the dehydrating beverage in addition to the daily recommended amount. That’s a lot of water! To help get you in the habit, have a water bottle (or two) with you at all times, especially when you’re performing. Another great way to keep your vocal chords hydrated is to steam. You can do this by using a facial steamer or by boiling a pot of water and breathing in the steam. Do this two to three times a day for about 10 minutes, when possible. Note: steaming can’t replace drinking water. Nice try. Though some suggest drinking hot tea or water before a performance, it’s best to avoid boiling hot water as it can cause inflammation, especially on already fatigued vocal muscles. Ice water, which causes muscles to contract, is not your friend either, particularly after you’ve warmed up or during a gig, as it can significantly reduce your vocal range. So, what do you do? Ideally, stick with lukewarm water. If you do drink tea—I like Throat Coat Tea—try heating the water and removing it from heat right before it boils. This way you get some warmth without doing damage. 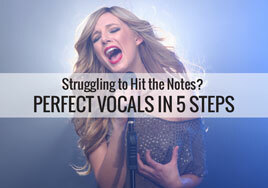 Like extreme temperatures, extreme vocal volumes can put a real strain on your voice. Over time this strain can lead to vocal nodules (nodes). These nodes are the bane of a singer’s existence, and it’s one of the major things we’re trying to avoid with all this vocal care talk. Nodes do not heal easily, so it’s best to prevent them, if possible. So what are these extremes of which I speak? You’ve probably guessed that yelling and screaming aren’t good for your precious vocal folds. (Though, you can be trained to scream properly, if that’s the sound you’re going for.) At the other end of the spectrum, whispering can also be too demanding on your vocal folds, especially if they are already overworked and in need of rest. So, what’s a singer to do? In your everyday socializing, try to be aware of the general decibel level of your surroundings. If you’re in a crowd, you may not realize that you’re speaking at a higher volume because everyone else is too. Sometimes those situations can’t be avoided, but when you can, speak at a normal volume. It’s the same when you’re rehearsing and performing. Over-singing is not good. 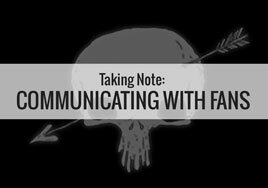 You’ll want to communicate with your sound engineer until you get a good monitor mix. You have a part to play in your mix as well. When you’re singing, you’ll want to make sure you’re close enough to the mic to kiss it. When you’re doing your mic test (testing 1, 2, 3), sing at the same volume you would during your performance so that your monitor mix will be accurate. And, speaking of monitors, in-ear monitors are ideal. Yeah, yeah—not everybody likes they way the feel or sound. However, if you have access to them, it’s a great idea to get used to them. Either way, without some kind of well-mixed monitors, the decibel level of the epic music being played around you can cause you to sing louder unnecessarily, resulting in vocal fatigue and strain. Lastly, resting your voice before gigs is ideal, when possible. For all you athletic-types out there, you know that before you start your workout, you need to warm up. You don’t want your hammy to cramp up. It’s the same with your voice. Before you begin rehearsing your set list, it’s a good idea imperative that you warm up your vocal chords. Your muscles need to stretch and warm gradually; you’re not made to suddenly go from inactive to highly active. To prevent injury (i.e. the afore mentioned nodes, swelling, laryngitis, etc.) and increase vocal range, stability, and expression, you’ll want to warm up those vocal muscles and practice correct breathing. If you’re not sure where to begin, it’s ideal to have a professional vocal coach’s direction with breathing exercises and other warm up techniques. If you’ve had some coaching before and just need something to guide you at home, there are plenty of vocal exercise CDs, videos, and websites out there. I’m a personal fan of Vocal Warm Ups & Exercises by Christina E. Branz. Whatever you choose, you want exercises that will help you breathe correctly and stretch your vocal range with walk ups and downs. Once you’ve done your vocal exercises, you want to stay nice and limber vocally. If you’re singing in a cold climate (whether outside or in a highly air conditioned venue), it’s not a bad idea to have a scarf handy—a trendy one doubles as a fashion statement, killing two birds with one scarf. Another way to stay warm is to continue your breathing exercises. And remember, your drink of choice for vocal health and optimal range should be lukewarm water. Smoke, smog, mountain cedar, milk. Whatever the cause, anything that increases your allergic response—mucus production, people—can impede the quality of your vocals. Sometimes severely. If you can avoid smoggy and smoky areas, do it. If not, for environmental allergies—as well as seasonal allergies—I like to use a nasal saline rinse (i.e. NeilMed Sinus Rinse, SinuCleanse, etc.) to wash away pollen and pollutants, reduce sinus swelling, and thin out mucus (I know, I know. Snot is gross. But it’s a reality.) There are also slippery elm lozenges, other herbs, and over-the-counter meds that soothe sore throats and help control seasonal allergies, but it’s probably best to consult a doctor before starting a new medication. Lastly, and not to be bossy, but… don’t smoke. That’s a completely avoidable nasal, sinus, and lung irritant, among other pesky health issues (i.e. cancers of various kinds). You may be going for that husky vocal timbre, but at what cost? Okay. I’m not your mom. I’ll step down off my soapbox. These five steps are so easy to implement that you really have no excuses. Go for it. Pamper yourself. Take care of that voice of yours, and it might just keep working for you for years to come. Two months ago, Meghan Trainor was an unknown songwriter. Even today, she isn’t a big, established artist… at least, not yet. But, if her first single’s smashing success on YouTube is any indication of the future of her career, she will be. 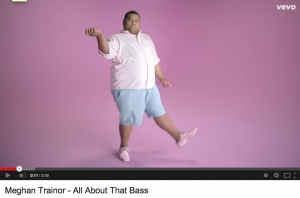 Trainor, a 20-year-old singer-songwriter, is the artist behind the single “All About That Bass.” The catchy pop tune stands tall on its own merits, but the accompanying music video is pure brilliance. And audiences seem to agree. 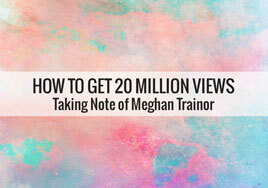 The video, which was released on June 11, already has over 21 million views. Not too shabby for an artist’s first single. This performance stands out because it has hooks in the video as well as a social message that connects with a large number of fans, not to mention that it also creates a little controversy. The hooks have to do with the unusual way that Trainor portrays herself and the other performers in the video. Not just the fact that they are happy with their size and shape, but some of the unexpected things that happen in the video. They also turn the tables on “skinny” people by using humor, casting, and choreography to make their point. Take a moment to view the video. I’ll wait. Done? Good. I bet you noticed Sione, an example of casting brilliance. He is over the top with his dance moves, and he adds a dimension of depth and fun to the video that has helped to propel it into a huge number of views. After viewing the video, are you compelled to share it with someone else? If so, then you begin to see how a video can go viral. Note that it does not matter why you want to share it, just the fact that you do. This important point is quite often lost on musicians who make their career in music. Launching a video that is well done, but not compelling, is not enough. By compelling, I mean: what does the viewer feel compelled to do after seeing your video? If the overwhelming answer is to share it with friends, then you have a winner. Otherwise, as a good friend of mine would say, “You have a double handed death grip on a loser”. The world is full of music videos that go nowhere, and they cost just as much to produce as a compelling video. Learn to let go of the loser before you start… or do what it takes to turn it into a winner and then hang on tight. 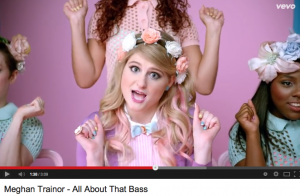 The song “All About That Bass” by itself probably would not create the kind of buzz necessary to get 21 million listens. It is the entire package—the song combined with the video—that knocks it out of the park. But let’s face it: video can be expensive. It would be fair to say that an inexpensive songwriting/performing/video-creation endeavor could easily cost tens of thousands of dollars. On the other hand, indie musicians are a very creative group used to working with very few resources. So, why not figure out a way to write and shoot a compelling video without a huge budget? It takes a combination of talent, flexibility, planning, funding, and desire to make all the parts work together smoothly, even more so on a small budget. It is not for everybody. Let’s take a closer look at Trainor and her video; then, we can explore what indie artists might do to leverage their music in this same way. Trainor writes about a very of-the-moment issue (body image) and has a positive message. Body image issues are nothing new, but they have become a much more public issue in recent years. Social media sites have turned into a battleground over women’s bodies. Memes proclaim that “nothing tastes as good as skinny feels”, incredibly thin models are lifted up as ideals (after being photoshopped into even more idealized versions of themselves), and women with “extra” weight are publicly ridiculed for their weight and their choices (in clothing, in food, in living). On the other side, there is backlash against “thinspiration” and excessive photo editing, heightened awareness about the dangers of eating disorders, and encouragement to be healthy and to love yourself as you are. Now, Trainor is, admittedly, not a size two. The girl has some curves. She also doesn’t appear to be unhealthy or overweight. But her weight and shape aren’t the issue, nor are they the focus of her message. Her message lies in her acceptance of her body for what it is. It’s not a skinny beautiful body. It’s not a fat beautiful body. It’s simply her beautiful body. And that message is something that girls everywhere—maybe people everywhere—need to hear. And, as an artist, Trainor does a good job of leveraging this topic by producing a compelling song/video combination. She stirs up a little bit of controversy. But don’t assume that some negative comments mean Trainor and her message are unpopular. Less than one tenth of one percent (0.001%) of the people viewing the video have taken the time to comment on it publicly—some comments are good, some are not. And for every “thumbs down” on the video, there are almost 22 “thumbs ups”. Most importantly, a huge number of people have been compelled enough by the video to share it with others. That is all that matters. Every part of the video—the concept, the casting, the styling, the shooting, the editing—is extremely well done. The video’s concept is simple: reinforce the song’s message by showing people comfortable in their own skin having fun and loving themselves—regardless of their size, shape, or age. There’s no complicated storyline to confuse the viewer, nor is it simply just another music video of a performer singing their latest release on a stage. The casting is impeccable. Trainor’s message isn’t limited to one group; it’s for everyone. It’s appropriate, then, that the people in the video are different sizes, shapes, ages, and genders, and they all look like they’re having fun, dancing and shaking whatever they have (or don’t have). Trainor is 20, and she’s new. She seems to be pretty talented (especially considering she had a songwriting contract at 18 and an artist contract at 20). She has a label that is obviously willing to invest in her, and she has an extremely talented team working with her. Your situation is probably different. You might be starting your career in music, or you might have been at it for a long time. You’re likely talented and creative and have music ready to release or that could be re-released with better promotion. You probably have a loyal local fan base, but you’d love for it to be bigger. You’re probably wondering how to branch out—how to get bigger and better gigs along with more visibility. Given that you’re in a different situation than Trainor, what on earth could she and her video possibly teach you about your career? Plenty. Songs that strike a chord with you will probably strike a chord with others. In a behind-the-scenes video, Trainor says, “My producer and I wanted to write a fun song… Why not do a song about loving yourself and loving your body? Because I don’t think girls love themselves as much as they really should. I think girls will really relate to it.” In an interview with the Today show, Trainor says that this is an issue she has struggled with personally. That personal experience and conviction help Trainor come off as a credible source on the subject, which means it’s easier for her fans to relate and connect with her. What does this mean for you? Well, first, you don’t need a team of professional, award-winning songwriters to write a good song. You can leverage your own life experiences, just like Trainor did, and create music that reflects who you are. Second, you should try writing about something that resonates with you on a personal level. Pick a topic that moves you, or an experience you’re intimately familiar with, and tell the story in a way that takes listeners along for the ride. If you connect with the song, it increases the odds of your listeners connecting—both with the song and with you. Most importantly, consider whether that connection will cause your viewers to share the video. Get creative with the process, and be sure to create a hook, something in the video that will make fans take action. Without a hook, it will not work. If you want a second opinion, try playing the song for the rest of the band, an impartial friend, another musician, or a songwriting group. Be open to their feedback and criticism, and genuinely consider what they have to say. Even if you don’t make the changes they suggest, the advice might come in handy on future songs. You don’t have to be a superstar to get lots of good attention. Before this release, Trainor was relatively unknown. She might have had a small local following, but she certainly wasn’t a household name. So, how did she get so many views? Simply put, Trainor thought outside the box—with her message, her styling, and her casting. Her positive message is on a topic that few artists address. The styling of Trainor’s video is surprising (in that it’s rather different from most other videos out there), but it’s wholly appropriate for the song. In Trainor’s video, Vine sensation Sione makes an unexpected appearance, which helps create a hook for fans of the video because of his unique style. Sione’s 440,000 fans (yes, you read that correctly) on Vine probably headed over to check out Trainor’s video, and I can guarantee that some of Trainor’s viewers headed over to Vine to find out more about the dancing man. Both artists benefited from the collaboration. That type of collaboration doesn’t take a label or tons of money. More importantly, thinking outside the box doesn’t take a label or tons of money. To be a successful independent artist, you must be creative, flexible, and resourceful; a ton of money to fund your project is not required to make this work. This might mean you tell your song’s story from an unexpected angle. In Five Seconds of Summer’s video for “She Looks So Perfect”, the characters in the video strip down to their underwear. This in itself is a little surprising (but fits with a line in the chorus). What is unexpected is the type of people who strip down: highschoolers, a store clerk, a middle-aged mom, a cop, a grandmother, a pair making eyes at each other in a diner. Basically, everyone but the young and fairly attractive band members. It’s not just young, fit, beautiful people stripping. It’s everyone. This is the hook for an otherwise unremarkable video that now has over 67 million views. As I said at the very beginning of this article, Meghan Trainor isn’t a big, established artist… yet. I think she’s incredibly talented, and I think she has a talented team helping her. I’m extremely curious to see how she follows up on this first single. Only time will tell. As for you, the indie musician with your own style and talent and career, I want to know what you think of Trainor’s video and what you’ve learned from it to use in your own career. What’s your next move? The cursor sits there, flashing impatiently, daring me to fill the page with words that mean something. I have a vague concept in my head, but it shifts when I try to see it more clearly. I start writing and get a few lines down, then backspace to delete them. They weren’t quite right. I repeat this process a few more times. Nine, to be exact. I drum my fingers against the desk again, frustrated. I’m tempted to move on to another topic, or to stop trying for the day. This is what I do. I write. So why is it such a struggle today? Because I’m obsessing over it. I’m so focused on finding the best way to start the article and the most logical way to lay it out and the ideal story to include that I’m not making any progress. I’m getting in my way and preventing myself from accomplishing the task at hand. It’s frustrating. Moreover, it’s difficult to overcome. But it’s not impossible to overcome. I just have to stop obsessing on getting it right the first time and let the thoughts flow. I can go back and rewrite it later, as long as I have something to work with. If I keep obsessing, I won’t have anything to rewrite. I sigh and slowly start typing the thoughts floating in my head, praying something coherent forms. I don’t delete this time. I can confidently state that I’m not the only person who has experienced writer’s block. I think that, at some point in their life, every person has struggled to find the right words. Nor is this struggle—this obsession with perfection that prevents progress—unique to writing. I’ve seen it in musicians. Yes, in the more obvious instances, with songwriting. The songwriter languishes, much as I do, over how to best express the thoughts in his head, and he struggles with fitting the words into a melody. He has notebooks full of nearly complete songs, each abandoned in a moment of frustration and shelved for a later date. Over the years, he has completed a few songs, but most wait, unfinished. I’ve seen it in other ways, too. I hear musicians talk about their recording process. They work hard for years, saving up money from gigs to pay for THE BEST studio, producer, and audio engineer. They spend a small fortune—enough to buy a house, in some places—on the recording process, and then they sell their music for $10 a CD, or $.99 per song. If their recording costs were $50,000, they’ll need to sell 5000 CDs to break even on recording alone. 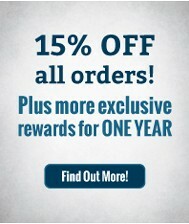 It’s not an impossible number of sales, but it is a big goal. Now, their music sounds wonderful… but I can’t help but wonder what would have happened if they hadn’t obsessed so much over the quality of the recording and had released music over those years, instead of waiting. Would more-frequent releases have kept their fans interested? Would creating a recording budget based on the size of their fan base and anticipated sales have turned out better for them than setting the budget according to their dreams? Would investing less in the process up front result in bigger returns on each investment, allowing them to work their way up the quality chain over time? I’m not suggesting that they record it on their phone in the garage to save a few bucks. But… surely there is a better way. Another artist recently told me that his next album has been years in the making. He’s not so obsessed with which studio does the recording as he is with how the songs sound. He’s been performing these songs for a few years, and he’s been in the recording process for over a year… but he’s can’t quite get the songs to sound the way he wants them to. So, every few weeks, he heads back to the studio to tweak one song or another. Most people—non-musicians, at least—probably won’t be able to tell the difference between the versions, but he refuses to release it until it’s perfect. I can’t fault him for wanting to put out a quality product. It’s his right, after all. The music is his, and the music reflects his talent, commitment, and professionalism. But… at some point, it doesn’t make sense to keep going back… does it? At some point, you have to accept the recordings as exceptional instead of truly perfect. Right? It’s not just recording that musicians obsess about. I’ve seen artists hold up projects for months by focusing on minor graphic design details that are, when it comes down to it, entirely preferential and won’t be noticed by the majority of the population. I’ve seen artists who are so focused on not letting an opportunity pass them by that they become overzealous. They flood inboxes with every song they’ve ever written, instead of submitting just their best material, or they reach out to their contacts too frequently to follow up on submissions or openings. Their “just checking in” messages start driving away managers, publishers, and booking agents before the artist even gets a fair shot. Doors lock shut before they were even opened. I’ve seen artists so tuned in to their web stats that they can accurately spout off their follower counts off the top of their head. They know their ideal posting time per platform, and they make sure that they have content ready to release at those times. Google Analytics is always running in an open window on their laptop, ready to be refreshed; it’s like a stock ticker. They spend days fine-tuning their keywords, trying to bump their website ranking up a notch. All this effort means they’re pretty connected to their fans (as much as you can be, through social media), but that’s hours a day that they aren’t spending writing, recording, or performing. In other words, that’s hours a day that they aren’t spending as a musician. If I can say one thing about these talented, driven musicians, it’s this: they care about their career, about their craft, about their music. Caring is a good thing; I’d much rather have a musician who cares immensely than one who couldn’t care less (and those do exist, but that’s a separate article). And what they care about—releasing complete songs and quality recordings, creating products that visually represents their quality music, pursuing opportunities to advance their career, optimizing their web presence, and connecting with fans—is inherently good. The problem lies, then, with how much these artists care. It’s to the point of obsession. They are so focused on perfection, in one form or another, that it grinds everything down to a standstill. 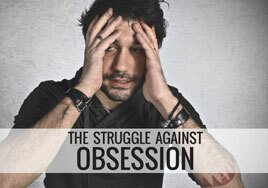 If left unaddressed, the obsession starts to hurt them, to choke the life out of their career. And that’s the last thing they want. If you’re in this camp, this group of obsessive musicians, you might be wondering how you can break free from that struggle. First, it helps to remember that you’re human, which means perfection isn’t attainable. (That might take some of the pressure off your shoulders.) Stop trying to live up to some unattainable inhuman standard, and simply focus on being the best you possible—flaws and all. Your flaws are just as much a part of who you are as your strengths. Second, remember that art—including music—is subjective. Not everyone will love what you do, and you’ll always be able to find someone, somewhere who has an opinion on how you could have done something differently to improve. Know that this isn’t true for just you. It’s true for all artists. Third, keep the big picture in mind. If you find yourself obsessing over the pantone color and opacity of the drop shadow on your album liner, or whether or not you need a skosh more reverb on that one track, or why your cousin’s neighbor’s ex-boyfriend stopped following you on Twitstabook, take a step back. Ask how this piece that you’re struggling with fits into the grand scheme of things. What is the long-term effect that this has on your career? Are there better uses of your time? Does it really need attention, or is it actually good enough to let go of? I don’t want you to stop caring about your career, about your craft, about your music. I love that about you. But, I don’t want your career to suffer. At all. Especially not because you spent so much time, resources, and energy caring too much about things that, in the end, didn’t make as big a difference as you thought they would. I want you to find balance. Keep caring, but don’t let it hurt you. Keep striving to improve, but know that perfection is unattainable. Set those crazy high goals, but throw in realistic, attainable steps to help you get there. Pay attention to the details, but don’t forget the big picture. So, I wrote this article. And if I can stop obsessing enough to finish this article—flaws and all—you can stop obsessing, too. If you’re a songwriter in the early stages of your career, the idea of being hired as a staff songwriter for a publishing company is akin to winning the lottery. It’s the Holy Grail you dream of finding. It means industry recognition and validation of your talent, and it carries the promise of cuts, movie placements, and other exciting possibilities. However exciting a deal may be, it’s important to keep in mind that entering into a relationship with a publisher is serious business. As with any business relationship, it’s essential that you, as the songwriter, understand what you’re giving up as well as what you stand to gain by signing over any of your copyrights to a music publisher. In general terms, a typical publishing deal involves the assignment of some part of the ownership of your songs to a publishing company in exchange for a monthly payment, known as a draw. The publisher might also use their industry relationships to provide co-writing opportunities, or they might use members of the publishing company’s staff to pitch the music to their industry contacts. As with any arrangement, there are potential benefits and potential drawbacks, which I’ll address here. A Draw – Committing to a full-time career in music is hard, especially if you don’t have money coming in to pay the bills. If you’re just getting started and don’t have money coming in, the monthly draw provided by a publisher can ease that burden. Some draws are large enough to allow you to write full time; most are more modest, which results in you splitting your time and income between songwriting and a part-time job. Demo Budget – Making high quality recordings of your songs is not cheap; having a publisher foot the bill for these recordings can help out quite a bit. Song Pluggers – These are employees of the publishing company whose only job is to find opportunities for your songs. Having a team of staffers dedicated to this task means you can focus on writing music. Clout and Connections – The credibility that comes from signing with established music publisher is a powerful thing. It can open doors to meetings, co-writes, and powerful industry connections. Moreover, the publishing companies rely on their relationships with record labels, producers, artists, and a variety of other music business decision-makers. Those relationships take time to build, and they can be key to landing placements. 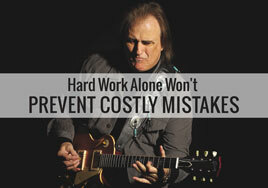 For a new songwriter who hasn’t had the opportunity to network much on his own, this can make a big difference. Validation – The validation that comes from a publishing deal is what most beginning songwriters long for. If you’re in the early stages of your career, you’re most likely writing songs behind the scenes and working in obscurity. You might not have received praise and recognition from anyone in the industry. In addition to being nice to hear, I’ve found that validation leads to an improved work ethic and, occasionally, inspiration. This is where I’d recommend paying close attention. I know the idea of being able to write songs and have your publisher take care of all the details is an appealing thought, but the reality is a bit more complicated. This is a business, and it helps to remember that a publisher is giving you something in order to get something. Your draw & demo budget are essentially loans. The money that makes up your draw and your demo budget is money that the publisher will recoup from your share of the rights as soon as your songs start generating income. Additionally, even after you’ve paid back the money they invested in you, the publisher will continue to own the rights to your song (whatever percent you signed over) and make income from it. It’s also worth noting that the publisher usually owns the recording they paid for you to make; this means that there is no master fee payment for you, the songwriter, if that recording ends up placed in a film or on TV. Your songs still have competition. Even though the idea of a song plugger working to get your songs heard is comforting, the reality is that, in most publishing companies, there are many more signed writers than there are pluggers. In other words, while your songs are your top priority, they may be among the hundreds (or thousands, if you count the back catalogs of most publishing companies) that the overworked song pluggers have to consider for every pitch opportunity. Validation is NOT enough. As a songwriter, I understand how good it feels when someone in the industry tells you they love your songs. In and of itself, this is not enough of a reason to give away your publishing. As a writer, you should be working constantly on your craft, using resources like song critiques, songwriting organizations, and your peers for feedback; if you’re doing this, you’ll know when your songs are good, and you won’t need a publisher to tell you so. My intention is to empower, not discourage, you by showing that a publishing deal isn’t the only (or best) answer to your songwriting prayers. Ultimately, the most sustainable career as a songwriter is built by learning to do things for yourself. Be your own publisher. You don’t need an established publisher to publish your songs. It’s a relatively simple proposition to start your own publishing company through one of the performing rights organizations (ASCAP, BMI, and SESAC). A simple phone call to one of these three organizations can get you started. Put yourself on a regular writing schedule. If you want to be a professional songwriter, act like one. Set aside regular times to write, and treat it like a job. Folks in the working world don’t skip work because they “don’t feel like it”; neither should you. Pitch your songs. Actively look for opportunities for your songs. It’s one thing to write a good song and have a great demo, but if no one hears it, it can’t possibly generate any income for you. This isn’t the glamorous, romantic part of the business, but I promise you, the overwhelming majority of successful songwriters—even those with publishing deals and song pluggers—spend a lot of time pitching their own material. You need to do everything in your power to get your songs heard.Also, as I mentioned above, no one will make your songs a priority more than you will. Network. Another less-than-pleasant reality for the gifted, introverted songwriter is that there is no substitute for the relationships you make in the industry. Get out there and meet people. This doesn’t mean you have to be fake or stay up until 3 a.m. drinking every night (unless you like that kind of thing). It does mean that you have to find opportunities to interact with the decision-makers in the music industry. I recommend attending music conferences, songwriter festivals, and some of the events sponsored by organizations like the Nashville Songwriters Association International (NSAI) or the Songwriter’s Guild of America (SGA). Sign an admin deal. If you’re starting to get some cuts and placements for your songs and the subtleties of copyright law, royalty statements, and licensing feel like too much to keep track of or negotiate, you might consider signing with a publisher to administer your copyrights. In other words, instead of giving away ownership of 50%-100% of your copyright, give a copyright administrator 15%-25% to “mind the store” while you’re taking care of the other stuff. If you’re making money from your songs, you’ll have no trouble at all finding an experienced publisher to administer your copyrights. Again, for the sake of simplicity, I’ve kept this article and the terms of a publishing deal very general. In reality, deals range from basic copyright administration all the way to full ownership of your publishing, and there are reasons for and against all of these arrangements. 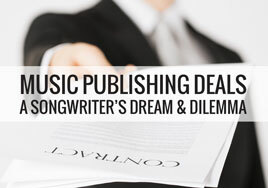 Music publishers provide a valuable service in our industry, but signing a publishing deal isn’t always your best option. If you’re considering a deal, be absolutely certain you understand what you stand to gain (beyond the simple validation of your talent) and what you’re giving up to get it. 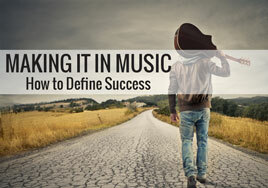 In the world of professional songwriting, there is no one way to achieve success. Regardless of the path you take, the more you understand and can do on your own, the better off you’ll be.